Owen County students chop up vegetables at Recipes for Life. Photo by Katie Pratt. OWENTON, Ky. (Nov. 8, 2018) — In today’s fast paced world, many families find themselves in line at a fast food restaurant more often than gathered around the dinner table. A University of Kentucky Cooperative Extension Service program in Owen County is trying to change that. 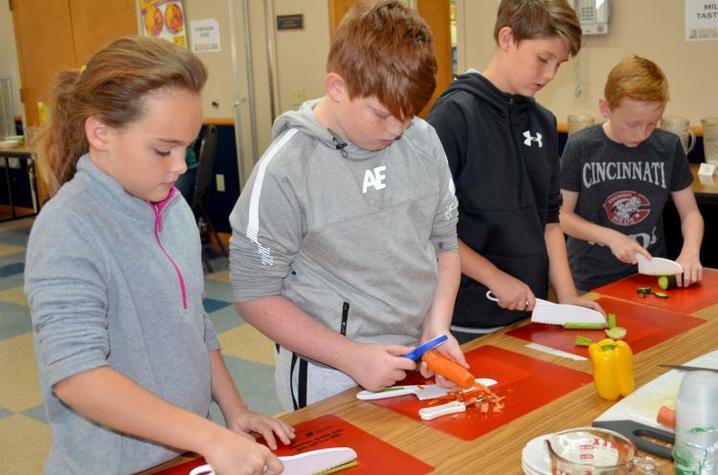 When the students are not cooking, Cooperative Extension Service volunteers teach them about nutrition-related topics like portion size, fats and sugars, and expose them to different types of milk and produce. They also bring in a family recipe to share with their classmates.